I just love it when couples do their wedding their way, for couples like Christine and Ed that meant putting tradition aside and creating a day that could enjoy every moment of together. 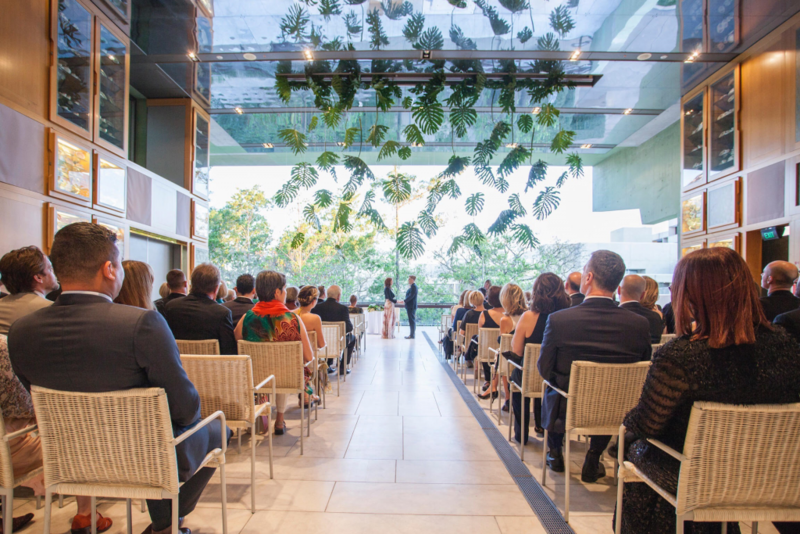 Their black tie wedding ceremony and reception took place at the grand State Library of QLD in South Brisbane. The couples modern wedding commenced with both the bride and groom welcoming the guests as they arrived, which really set the tone for the relaxed vibe. The couple opted not to have a bridal party, and Christine decided not to have a wedding bouquet as she simply didn’t feel the need to have one. They did however have Francescas Flowers install a dramatic hanging Monstera cheese plant leaf display and the greenery worked perfectly with the high ceilings of the Terrace Room. When the ceremony time arrived, the guests were seated and the bride and groom, holding hands took a relaxed stroll down the aisle together before turning to face each other as the ceremony commenced. The lovely couple couldn’t take their eyes off each other as they enjoyed their short, sweet and authentic ceremony. They could barely contain their excitement when I pronounced them husband and wife! Congratulations to the happy newlyweds and thank you for choosing Brisbane City Celebrants for your State Library of QLD Wedding. As a Celebrant you never know who might be a guest at a wedding you are the Celebrant for. I found out after this particular wedding that a fellow Celebrant was amongst the guests and was kind enough to contact me with the following feedback and permisison to share this publically. 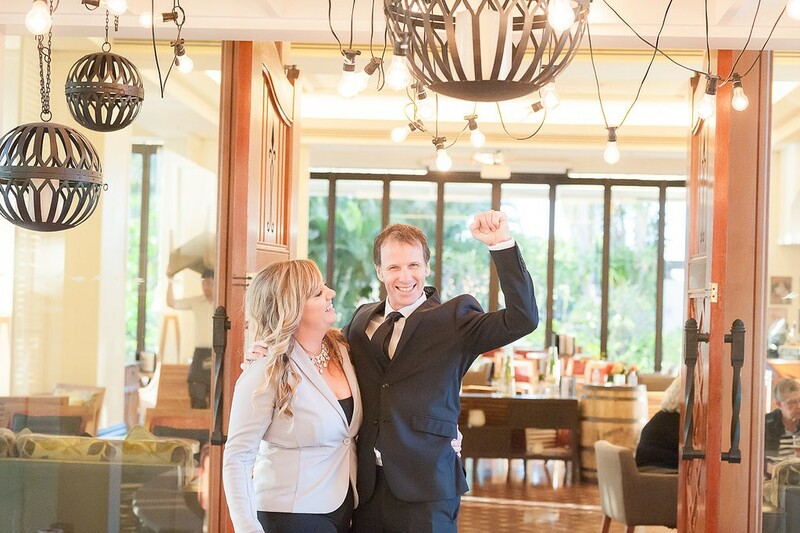 Brisbane City Celebrants Jamie Eastgate Fist pumping over this fellow Celebrants feedback! It’s worth mentioning that as Celebrants we tend to witness ceremonies through slightly different eyes, we listen out to hear if the legal wording is correct, we are looking to see if the couple are at ease and if everything is coordinated smoothly, if the PA equipment is of high quality, I could go on but I’m sure you get the gist. We met briefly at Dash and Ben’s wedding. While I will leave it up to them to comment on their experience with you, I just thought I would give some extra weight to their inevitably positive comments by putting in with my ‘2 cents worth’ as a former Authorised Marriage Celebrant (one of the busiest and preferred on the Gold Coast – one of Australia’s most competitive markets) who ‘handed in his badge and gun’ due being too busy with another business. 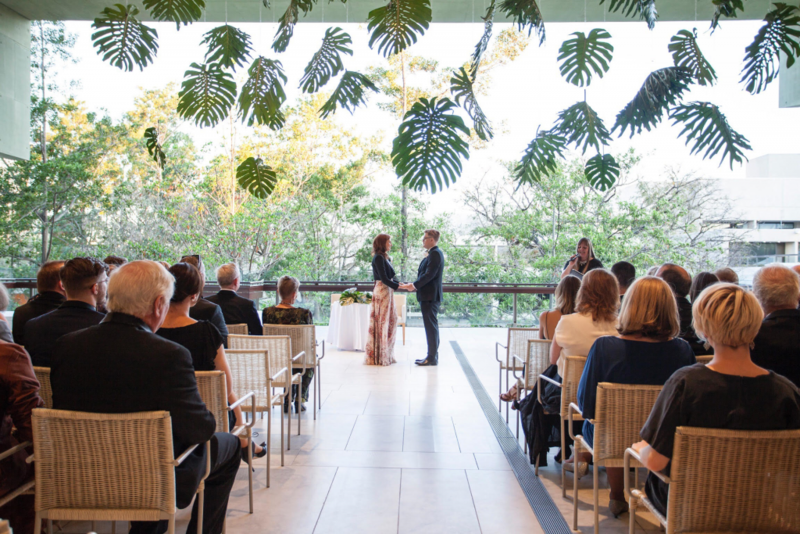 There is a distinct balance that any marriage celebrant has to manage – that between ceremony length, and ceremony meaning. Mate, you hit it out of the park! What an absolute delight to see the bride walk down the aisle to a song that had a genuine meaning to the couple, and gave those present a real insight into their relationship. Better yet, you helped them to ‘cultivate’ some of the most beautiful vows I’ve ever heard. The vows are always a tough one. Often (not always) the groom comes to you with one sentence, and the bride a 400 page novel! Sometimes, vice versa! Providing suggestions in this case is the domain of a Celebrant – and you clearly did this with distinction and care. I also appreciated your ability to blend the legally required wording within the ceremony – so that it didn’t sound forced or out of place. This, as I am sure you understand, is one of the most difficult challenges to any celebrant. The words are very much bureaucratic ‘speak’, while the ceremony still needs to be loving. 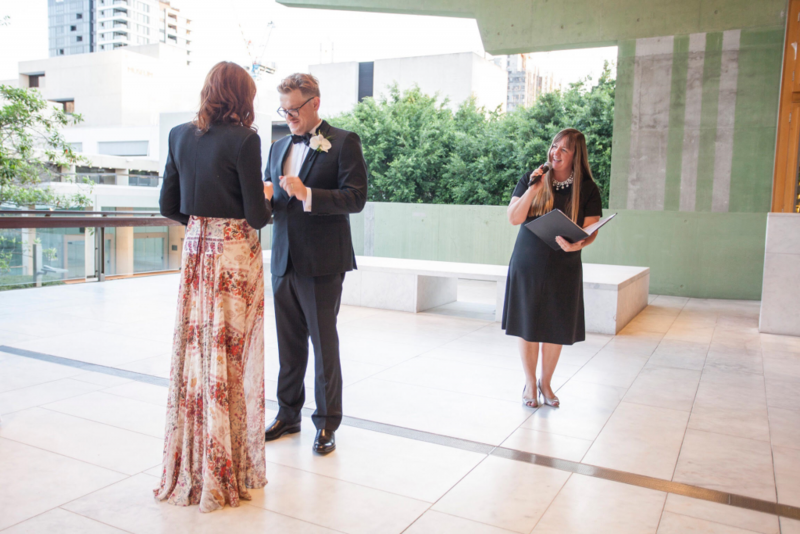 Unlike many other celebrants, your ceremony was carefully and creatively worded, 100% legal, and beyond that – one of the (many catholic, church going attendees) will give serious thought to replicating in the future. I spoke to a number of the group afterwards who had gone for the ‘full church wedding’ – and they were 100% astonished (in a positive way) about your ceremony. Customers often don’t understand why a Celebrants fees are what they are – the reality is, there is “many many many” hours behind the scenes that goes into a successful wedding. A huge thank you to Will for taking the time to contact me and provide this feedback, receiving a Celebrant Testimonial (from a Celebrant!) of this calibre means so much! If you enjoyed hearing this fellow Celebrants feedback on a wedding performed by Jamie, and are looking for a recommended Celebrant for your Brisbane wedding, Jamie would love to hear from you. Contact Brisbane City Celebrants for more information and to confirm availability for your special day.